The Blackbird-TA is based on the high frequency section of the iconic JBL 4425 Studio Monitors. The JBL 4425 was designed to provide even dispersion in the horizontal and in particular, vertical plane. This was made possible with their radical bi-radial horn, the JBL 2342. This horn is capable of an amazing 100° x 100° coverage. The Blackbird-TA leverages on the unique properties of the JBL 2342 horn for excellent dispersion in HiFi and Home Theater use. She is not intended to replace the JBL 4425 in recording studios. Fig 1 – Mic at 1 meter, tweeter axis. Impulse Window = 5ms. No Smoothing. The Black plot in Fig 1 is the RAW response of the JBL 2342 horn with a JBL 2425HS compression driver attached. This is a fantastic response. The roll-off from 2kHz~20kHz is virtually constant. The Red plot is with a 2nd order filter, complete with compensation networks. The JBL 2342 is flat from 1.2kHz~10kHz. After 10kHz, she rolls off constantly. Horn cut-off is at 1.2kHz. Fig 2 – Mic at 1 meter, tweeter axis. Impulse Window = 5ms. No Smoothing. Measurements below 500Hz are in Nearfield. The Black plot in Fig 2 is the RAW response of HiVi M8a mounted onto Blackbird-TA enclosure with a baffle width of 10.5″. The horrendous breakup of metal cones can be clearly seen. The most problematic one is at 2.5kHz, followed by a final burst at 7kHz upwards. The Blue plot is the M8a with a 2nd order filter with a corner frequency of 1.2kHz. I ended up using an additional network to further suppress the 2.5kHz peak. It is now -20dB down, far lower than with just a 2nd order filter. Fig 3 – Frequency Response of HiVi M8a and JBL 2342. Fig 3 shows the Frequency Response of HiVi M8a and the JBL 2342. The two drivers are crossing acoustically at about 1.3kHz. Fig 4 – Frequency Response of Blackbird-TA. The Blackbird-TA frequency response is shown in Fig 4. There is a +3dB bump at the crossover frequency of 1.3kHz. This indicates a classical 12dB/oct Butterworth crossover. Fig 5 – Blackbird Crossover Null. A deep -45dB null is observed when the JBL 2342 is wired in reversed phase (Fig 5). This is a clear indication the Blackbird-TA is time-aligned. Fig 6 is the Waterfall plot of the Blackbird-TA. It’s interesting to note that there are more spectral decays in the JBL 2342 compared to the horn used in the JBL HT5. It appears that the ridges in the response are horn resonance. Fig 7 – Impulse Window = 5ms. Fig 7 shows the excess energy (light blue slices) of the Blackbird-TA. There’s a fair amount at 3.5kHz and 7kHz. The Waterfall plot of Fig 6 also shows longer decay at these two frequencies. The Spectrogram in Fig 8 is a two dimensional representation of the Blackbird-TA waterfall. The spectral decay is displayed on the right. 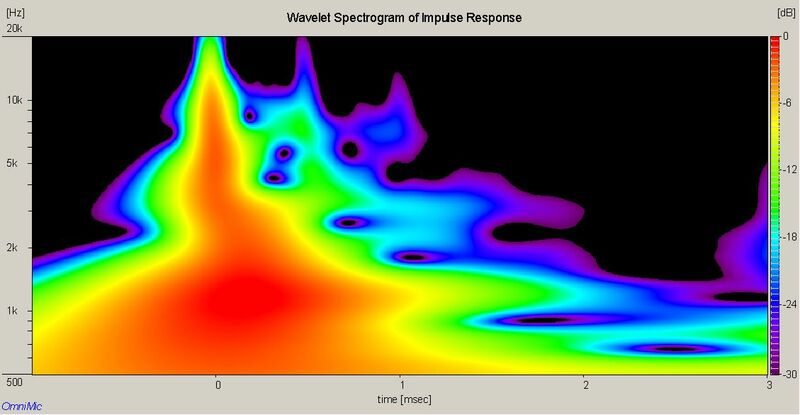 The blue and violet patches at 3.5kHz and 7kHz are the spectral decays in the waterfall plot. The +3dB hump at the crossover corner frequency of 1.2kHz is also clearly visible. Fig 9 – 2nd (Red) and 3rd (Violet) Harmonic Distortion. Measurements below 500Hz includes room reflections. Fig 9 is the Harmonic Distortion plot of the Blackbird-TA. The JBL 2342 horn with the JBL 2425 compression driver register low distortion of around -55dB below the fundamental. I’m relieved to see this because it means the horn resonances seen earlier did not end up as distortion. There’s a small 3rd order peak at 800Hz from the HiVi M8a. It is still well below the fundamental. It will have to audible effects on the Blackbird-TA. Simply amazing. The realism and sound stage of the Blackbird-TA are beyond all my other designs. I attribute that to the JBL 2342 / JBL 2425 combo. These large format pro drivers are in a class of their own. The amount of headroom is astounding. There’s absolutely no strain even when playing loud. As for the less than pristine waterfall plot, I can find nothing that interferes with my listening pleasure. There are newer horns that measure better but the JBL 2342 refused to go away. They are still used in recording studios and cinemas today. That’s 40 years since introduction. It only goes to show that the outstanding qualities of these vintage JBL’s are still in demand. Regarding the woofer, the HiVi M8a continues to impress me. The Blackbird-TA is a 35 liters ported box, tuned to 40Hz and this suited the M8a. The mid-bass dynamics are still there but now, she goes down to 40Hz. She’s a bit of a nuisance with the cone breakup but once that’s attended to, the M8a doesn’t disappoint.